EIBTM opens in Barcelona today (29 November) and expects to welcome some 3,800 hosted buyers from across the world who will take part in 60,000 pre-scheduled appointments with over 3,000 exhibitors. The show features a number of new digital innovations including an on-site TV channel, EIBTM TV, the EIBTM Event app and QR Codes, which are being displayed on the show floor to assist visitors in downloading information directly to their mobile devices. 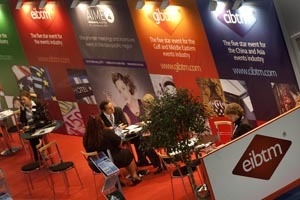 C&IT is exhibiting at EIBTM. Come and meet the editorial and sales teams on stand E350, and pick up a copy of C&IT magazine. Join us at 4pm on Tuesday for an Australian happy hour: Pick up a copy of our A is for Australia supplement, sponsored by Tourism Australia. The book is an A-Z of top tips and jam-packed with incentive ideas for event planners considering booking a trip Down Under. Preview the new virtualvenuevisit.com at 4pm on Wednesday: Come and meet the team behind www.virtualvenuevisit.com, the online resource for event planners. The new-look site will launch in early 2012, offering virtual tours of a selection of event venues from around the world.